Johnny Depp didn’t sugarcoat his answers to our questions about Willy Wonka, slime, and boogers. 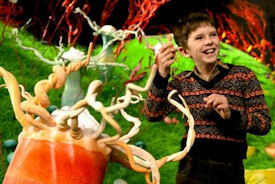 Did you read Charlie and the Chocolate Factory when you were a kid? Unfortunately, I’d read the book after I had already seen the original version of the movie. [Willy Wonka & the Chocolate Factory, from 1971]. Looking back, it would have been nicer to have experienced Roald Dahl’s book before viewing someone else’s interpretation. What did you think of the first movie? 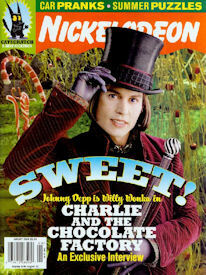 When I was a kid, Willy Wonka & the Chocolate Factory was an annual television event and we never missed it. I remember loving the film and particularly Gene Wilder [the actor who played Willy Wonka]. I still adore him. He’s an amazing actor! I have watched it with my own kids in recent years, but I went out of my way to not see it once I knew I’d be doing the film. I didn’t want to be too influenced by Gene Wilder’s performance. 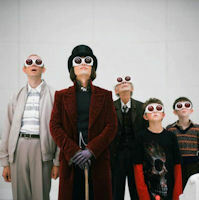 What inspired your Willy Wonka? A combination of the personalities of a game show host and a children’s program presenter. His persona comes out of fear and insecurity. [I was working with] the notion that if Wonka was uncomfortable with himself, he would build walls to hide behind. Why did you recommend Freddie Highmore for the role of Charlie? He’s perfect for the part and a great actor. Plus, I developed a close friendship with him when we did Finding Neverland and was excited by the possibility of working with him again and hanging out. He is a great pal of mine! How do you relax on a movie set? The best way to relax on a set is to read. I just read and read and read, book after book. Did you keep any Charlie souvenirs? I always keep souvenirs from my films. I think my kids will enjoy them someday. From Charlie, I took the chair and some costume stuff, like the cane and the teeth. Did you mind getting slimed at the Kids’ Choice Awards? I was honored when asked to be slimed. And I was not disappointed, either—it was a blast. I’m still trying to get the green stuff out of my clothes. Are you a nose picker? No, I am not now, nor have I ever been, a nose picker. Nothing scares me more than a booger!